Another day, another round of hysterical headlines on property prices from what will shortly be the Nine group, with News Corp not far behind. 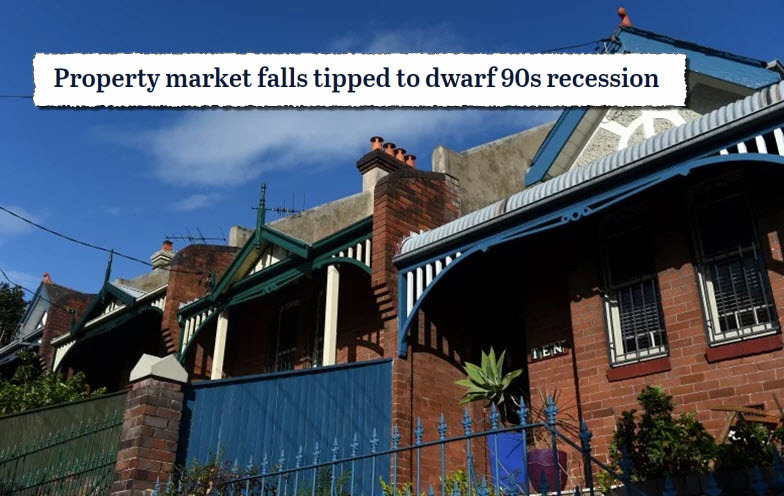 At the former, the property price slump will “dwarf the ’90s recession”; at the latter, it is “the worst ever” or “worst in a generation” (in the same article). Well, you gotta drive traffic to the only parts of your company that make decent money (your real estate listing sites) somehow, right? 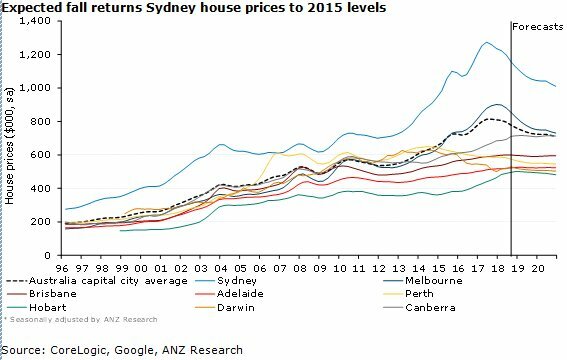 First, it’s a Sydney (9.5% fall from its 2017 high) and Melbourne (5.8% fall) issue. Perth and Hobart have come off a tad, but other cities are doing fine. Second, based on current falls, prices in Sydney, Melbourne and nationally (average national prices are dominated by Sydney and Melbourne) are set to return to where they would have been if the ordinary strong growth that those cities enjoyed over most of the last 20 years had continued unabated, rather than the supercharged growth of the last five years. What a catastrophe! And, despite what you’ll read in the papers, it’s not all down to macroprudential tightening that cut investor lending (a good thing in and of itself anyway). As the Reserve Bank’s Christopher Kent recently noted, it’s been a combination of tighter lending conditions and softer demand for housing finance, which in turn has encouraged banks to go after the smaller pool of customers. Some have attributed the slowing in housing credit solely to a tightening in the supply by banks in response to regulatory actions. Others have suggested there has been a weakening in housing demand and so demand for credit, including because of the high level of and weaker outlook for housing prices. To me, reductions in both the demand and supply of credit have been at play and it is hard to separate their effects. For example, tighter lending conditions have reduced how much some people can borrow, and this contributed to weaker demand for properties and so softer prices. Price falls have themselves contributed to weaker demand by investors who are no longer confident of rising values. Assessing the relative importance of demand and supply is also complicated by the fact that banks have cut back most on their lending to less credit-worthy borrowers, but have more aggressively targeted safer borrowers with lower interest rates. The hysteria from the media is telling about exactly what the priorities are for these outlets. It’s not so long ago that the same outlets — and in some cases the same journalists — were bemoaning how ridiculously expensive housing had become in Sydney and Melbourne and how a generation of young Australians were being locked out of buying their own homes. See also: the impacts of high immigration and rich Chinese buyers. But after a few months of relative declines from the supercharged growth of recent years, back to the merely strong growth that has marked our major markets now all the way back to the early 1990s recession, all that worry about Generation Rent being locked out has evaporated and replaced with fear-mongering about 10% price falls. Stuff the young people — why aren’t our houses rapidly appreciating anymore? Of course, young people aren’t wholly reliant on legacy media like Fairfax Nine. It’s often tailored to older people — homeowners, or mortgage holders, who already have a foot in the property market — and hey, maybe even have an investment property as well, subsidised by taxpayers thank you very much. Though the correction in property prices doesn’t do much to combat the systemic causes of poor housing affordability in Sydney and Melbourne — poor planning, NIMBYism, negative gearing and capital gains tax subsidies — it’s great news for younger people (and low-income earners), especially at a time of low wages growth. Don’t let that good news get in the way of Henny Pennies of the old media. The last time BK used Henny Penny as the chook claiming the sky was falling I pointed out that it was Chicken Little. Ms Penny was a hard working, sound & sensible farmer, miller and baking homebody. Speaking of homes, it is thing much to be desired were a house to cease to be an inflation proof, gold plated investment opportunity to those with too much money & too few ethics and again became … what’s the word… oh yeh, home for people to shelter from the coming shitstorm.